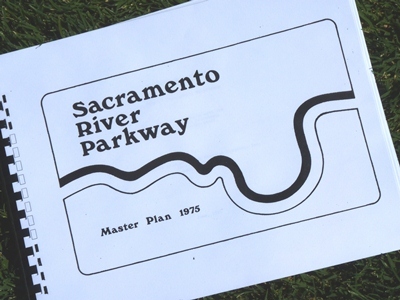 The Sacramento City Council approved the concept of the Sacramento River Parkway 38 years ago. 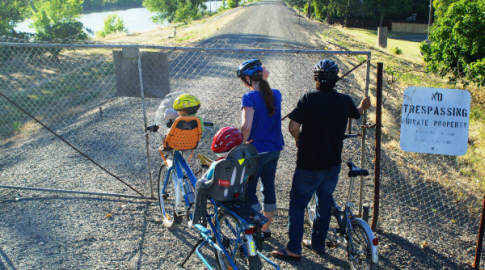 The Council reaffirmed its vision 16 years ago to complete a multi-use trail on the levee crown of the Sacramento River. Yet the Sacramento River counterpart to our world-renowned American River Parkway remains an unfulfilled promise. In the Pocket and Little Pocket neighborhoods of Sacramento, about half of the levee remains closed to runners, walkers, and bicyclists - blocked by private fences and gates that traverse the entirety of the levee, crossing even the state-owned land at the water's edge that's held in trust for public use under the centuries-old Public Trust Doctrine. Yet the State Lands Commission, our steward of these properties, fails to enforce the Public Trust. 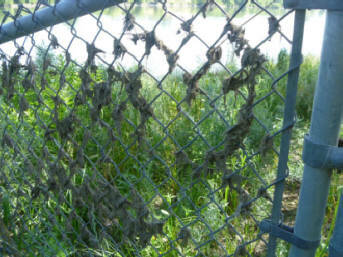 The fences and gates impede and add to the cost of levee maintenance. 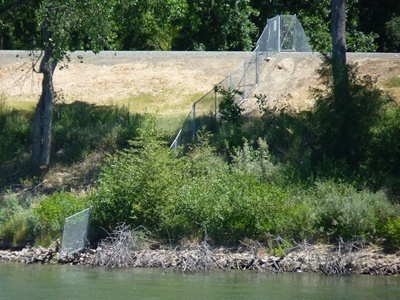 Worse, fences reach to or near the river's edge even though fences are a demonstrable flooding risk because they can (and have) caught debris during high flows, causing the current to direct back against the levee, eroding this vital bulwark against flooding in one of the country's most flood-prone cities. Yet the Central Valley Flood Protection Board, charged with keeping us safe from floods, fails to act against this threat. 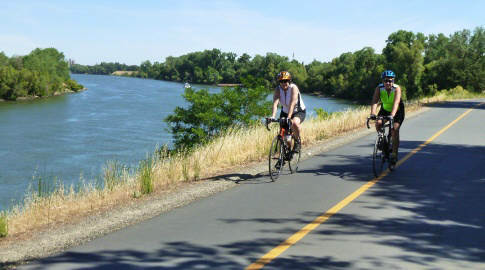 The Sacramento River Parkway is the first link in a plan to connect Sacramento and the Bay Area - the Great California Delta Trail. 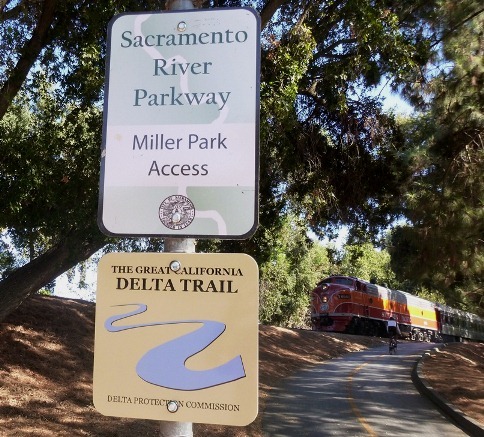 Without a completed Sacramento River Parkway, most of Sacramento will lack a direct pedestrian and bike-friendly path to the Delta Trail. 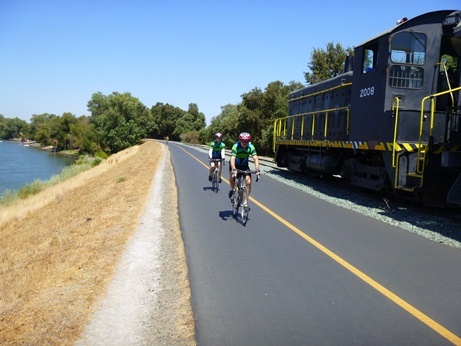 The Delta Trail will lead to a system of state parks and a network of multi-use trails around Sacramento County, and throughout the San Francisco Bay Area. The Sacramento City Council has taken an important step step toward completion of the Parkway. But angry property owners, who have maintained fences and gates to seize a level of privacy to which they are not entitled, have vowed to fight. We neeed to oppose this relative handful of residents who selfishly impose costs and risks on their neighbors by taking property rights from the public - rights that these property owners did not buy. We won't share your e-mail address. We will contact you only to share news that's important to all who support the Parkway. It's our river, and it's our right. Join us and let your voice be heard! Tell public officials you want change. Tell them you want access. Give us your e-mail address and the Sacramento River Parkway Coalition will alert you when issues arise at public meetings and when officials consider changes that may affect the completion of the Parkway. If officials know we favor the Parkway, the status quo will change. Click here for a link to more public documents relating to the Parkway.